Control crowds with ease with our yellow powdercoat temporary crowd control barriers, which are not only sturdy and safe but also eye-catching enough to stand out in a sea of people. There are many benefits to opting for yellow powdercoat as opposed to standard galvanised steel. More visible barriers make a crowd more respectful of the need to stay behind them, and are also more easily identifiable by security. Our temporary crowd barriers are made up of a series of panels that can be quickly and conveniently interlocked. They are durable and can hold up against abuse and jostling. Transportation and storage are easy, as these crowd barriers can be easily nested. All panels pivot smoothly on joints and stand on feet that can be bolted directly into the ground. Feet are kept as low to the ground as possible to minimise the danger of pedestrians tripping over them. The feet can also be removed to facilitate storage and transportation. 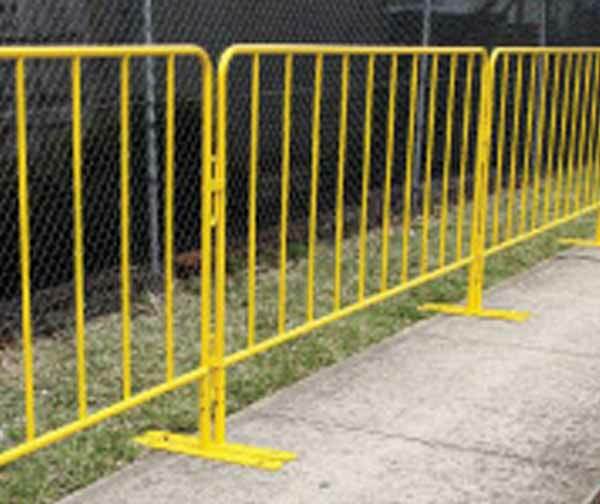 Yellow powdercoat temporary crowd control barriers are particularly suitable for use in areas see enormous amounts of human traffic. If it’s a crowd you think you’ll have difficulty reining in, the yellow powdercoat option can help considerably.